Bal Foyen is a small coastal zone neighboring Stonefalls in mainland Morrowind. It has little significance beyond Fort Zeren and its Dockyards. 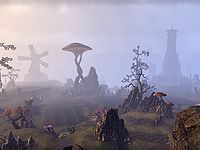 A large number of freed Argonian slaves have settled in the region, largely due to its swampy terrain, where they grow saltrice and herd guar and netches out of the village of Dhalmora. 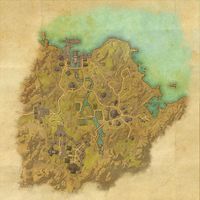 Following the evacuation of Bleakrock, Captain Rana will task you with warning the neighboring region of Stonefalls of the impending attack by the Daggerfall Covenant, while at the same time dealing with the invaders who have made landfall in Bal Foyen. If By Sea: Warn Davon's Watch of an impending attack. Crossroads: Choose who you will help with the defense of Bal Foyen. Breaking the Tide: Defend the docks from the Covenant. Zeren in Peril: Protect Fort Zeren from the Covenant. Warning Davon's Watch: Warn Davon's Watch about the Covenant attack. Finding the Family: Help a worried herder find his guar. Salt of the Earth: Help find some missing workers. The Bard of Hounds: Help find a concerned Argonian's friend. Unorthodox Tactics: Use an untested weapon against the Covenant.